Transform the way your business communicates using 3CX IP PBX (VoIP) save up to 80% on line rentals and call charges, not just offering lower calling costs but providing increased telephone functionality, improved business communications with customers and increased business efficiency. With 3CX, employees can easily see the presence of other users and avoid unnecessarily making or transferring calls. Presence is displayed in any standards-based IP phone, as well as in 3CX MyPhone. Furthermore, 3CX unifies voice mail and faxes with email by delivering them to the user’s E-Mail inbox. Installation, Management and Support 3CX Phone System can be installed and setup, saving your business money and benefiting from the commercial features provided by 3CX PBX within 2-3 days from receiving your order. 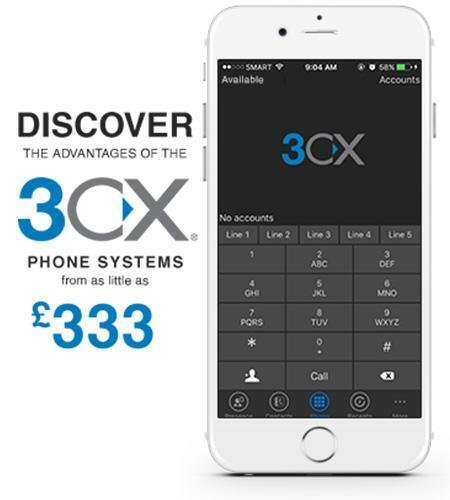 Why Choose 3CX Phone System? We are able to transfer your existing telephone numbers from your existing provider such as BT, Colt or Virgin and have them managed by the new 3CX Phone System. We can even talk to your existing provider and arrange everything to be transferred for you so you don’t have to worry. We understand that every business requirements differ and therefore before we provide a quote, we arrange a convenient appointment to visit you, so we can better understand your requirements and fully explain the features and cost savings of having our 3CX phone system installed.